Soul Mates, Soul Groups, and Soul Family… Have you met them? Movies, books, and TV shows always seem to portray soul mates as those passionately romantic partners who magically meet, and then live happily ever after… But like all things in reality, when compared to the ‘silver screen', there is much more to the soul mate story. By zooming out a bit, we can loosely define soul mates as those people who have strong soul connections. By ‘soul connections' I mean that their souls have met before, often many times, in a multitude of past lives and parallel experiences. Soul mates choose to come together in physical reality, to support each other in accomplishing their life mission and purpose. You don't only have one soul mate. There are many souls who are manifest here and now in the physical, and when you meet, they serve to guide you in the direction of your authentic path and soul purpose. These are your soulmates. When you meet one of your soul mates, there is usually an instant attraction and connection, which does not have to be romantic. Sometimes soul mates are romantic partners, who come together lifetime after lifetime, sometimes a soul mare manifests in your experience as a true friend, a soul family member or sometimes, they manifest as the people who will challenge you most, because that challenge is exactly what you needed at the soul level to get back on track. But for now, although we each have an underlying connection with everyone and everything, we do perceive ourselves at the personality level to be separate. In the book of life or ‘Akashic record' there are records of those souls who have met as physical beings time and time again. So while in the bigger picture, we're all essentially ‘divine soul mates' in complete oneness, while alive as humans in the physical, we have natural soul mate connections with those whom we strongly resonate with vibrationally, have shared histories with, and share supportive and similar purposes with now. When you meet a soul whom you've encountered at the personality level in many lifetimes, they will feel familiar to you, like you've met before and you will often know and feel the soul mate connection. Depending on how closely you've known and connected these soul mates connections can loosely be categorized as being a part of your soul group or soul family. Your soul mate relationships at the ‘soul group' level are with those souls in physical form who are currently walking similar life paths. You have a common shared purpose with your soul group members, and therefore you often have similar life experiences, interests, and upon meeting you have a strong feeling you've known each other before (you have!). The people in your soul group are your soulmates in that you have met each other in past or parallel life experiences, and you have a common purpose now, but they're not typically a part of your closest inner circle. The people in your soul group may be your classmates, acquaintances, true friends and co-workers here in the physical who you are also connected with at a soul level. Meeting those in your soul group is meant to and will impact you in a positive way through friendship, or even if you only meet once or twice. Your soul group connections are many, and while these relationships may come and go, they often leave a mark, help to realign you with what is important to you at the soul level, and they inspire you to make changes, or offer support at times of accelerated change and personal transformation. The more in alignment you are with your soul path, the more of your soul group you will meet. Soul family relationships are with those soul mates whom your relationship goes ever deeper and lasts longer than with your soul group (this lifetime and beyond). Your soul family is your close inner circle of souls who help you to align with your soul purpose in this lifetime, but they also love, nurture, inspire, protect, support, and comfort you through your ongoing connection. When you meet those soul mates who are a part of your soul family, the connection is immediately strong. They seem familiar and feel like family to you, and there is an underlying love and knowing of your soul connection from the moment you meet. There may be those in your soul family who you have had romantic relationships with in many lifetimes. Many people have a few soul mate partners who they connect with regularly, and then you also have soul family members who can be likened to your soul parents, siblings, cousins, children… and more! Whether your soul family connections are romantic or familial, there is an instant spark of love, connection, and a draw to support each other and spend time together. Your soul family is a part of your soul group too, but the relationship is deeper, and lasts longer. Soul family relationships in and out of physical reality are ongoing as these families of souls are drawn together time and time again. Sometimes your soul family will incarnate as your birth family members, but often they will not. You likely have some soul family members who are supporting and guiding you from the realms of spirit. If you do have soul family present on Earth now you will likely meet some of them, especially as you continue to align more fully with your soul path and purpose, which brings you into alignment with your soul family who can help you to progress even further. Check out our Soul Mate Love Meditation here! P.S. Ready for more? Click here to learn more about the difference between Karmic, Soul Mate, and Twin Flame Relationships. P.S. 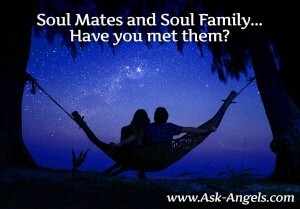 Have you met any soulmates from your soul group or soul family? I love hearing from you… Leave me a comment below or on facebook! Im guessing I’ve met a member of my soul group and a member of my soul family from your descriptions. When I met my husband I wasn’t interested in a relationship and not him either, but when he asked me for my number, I was halfway through saying it when I realised I wasn’t going to give it! So I ‘went with it’ and started seeing him and found myself worrying about him when he had to walk home in winter darkness for a few miles down unsafe country roads. At one point when shopping and talking with him on the phone I thought ‘I have to end this, I’m just not interested or ready for a relationship right now’ but before I got to saying it the trolley stopped dead, wouldn’t move and I had the thought ‘just go with it, give him a chance ‘. So I did. Then about 4 or 5 months later I met his brother. I had the strongest reaction I have ever had about anyone. Immediately I felt and thought that ‘we would be and should be very good, best of friends”. But no sooner had that split second thought ended was another but this one said ‘be careful around him, he’s dangerous’. I also felt in those seconds that I knew him from at least one previous life. I think I was subconsciously manipulative as I found myself putting distance between us by my speech, what I said not how I said it. And it’s been this way for 8 years now. Although we very rarely see each other, he is on my mind a lot. I sometimes feel an attraction to him and other times I wonder ‘what am I thinking?’ and can’t figure out why I’m attracted to him and feeling this way. I have Occasional dreams about him and daydreams often. I got confused about why I was upset the day he got married. I’ve been pulling myself out of depression for a while now and I’m just realising I’m going to have to be brave and talk to him! in the states and didn’t know much about him at the time. By reading his biography I’ve come across many similarities in our lives and personality. Still think it’s a bit strange, but I cannot conclude otherwise than him being a soul family member of mine. Such a lovely soul, by the way. Thank you for showing up in my life, …! Your description of what it’s like to meet a member of your soul family is spot on! I looked into her eyes and I KNEW. She felt it too, and it was nearly instantaneous, but I hid my feeling until I knew it was safe to broach the subject. It was. It was a truly mysterious experience, and it continues to be, and you got it right. I believe I have met one. Absolutely! When I was in my teens, I dreamt of meeting a Canadian romantic soulmate. I am Australian, how was it possible, we are on opposite sides of the world, as far as you can fly. I did, I am 55 and he, 49, my twin flame soulmate, after years of disappointing relationships we found each other. Then we meet a guy in a bar and the attraction was instantaneous from both of us, he is our soul family, a brother, a teacher, an annoyance a lot but we know withput a shadow of a doubt that we are meant to be together. If my partner and I miss a day without him, we feel abandoned, the feeling is mutual. Thanks for pisting this! At the the festival of book launching, while I was looking at some books, I heard a male voice say “Hello, are you looking to buy a book?”. When I turned around, the voice belonged to a gentleman about 73 years of age, with long curly greying hair. We spoke and exchanged our phone number and e-mail address. 2 days later he phoned me together we had coffee. We ended up sending e-mail messages to each other. One day when I phoned him, he seemed veery upset. His partner had committed suicide 12 years ago, he was thinking of her (he thinks of her every day) and also he had Parkinson’s disease. They had been together for 15 months, She had genetic ( disorder of the nerves) plus her medical practitioner had given her wrong medication. (He is a married man with family). Because of his condition he is very sad sometimes and thinks of his partner who passed on 12 years ago. The strange thing is that whenever I talk to him on the phone lovely piano music comes on, which lasts for few second. It happened about 7 or 8 times. Because of his condition he is very sad sometimes and thinks of his partner who passed on 12 years ago.He does not hear the music, only I do. I believe that is some sort of message to me, I cannot make out what it is. I wish I knew. I have met my soul mate and some soul family! 2 I met volunteering! It was as though we had known each other. One I call my soul sister, she calls me the same. Our paths were almost identical even though she is young enough to be my daughter. The other one is older, but we were on the same vibration! Then My romantic relationship, we took almost 4 years getting to know each other before meeting. We had split for 1 yr, but I never gave up. I KNEW I was supposed to be with him. Could never explain it to anyone how I knew, just did! When we finally met Dec 8th, it was like we had been together all along! I have been with him since, and what I have with him is something I’ve never had in my lifetime. I am happy, but even more than that, I have a peace within. No stress, and I’m at a higher level spiritually! I love life and everything around me! Thank you for your uplifting words! You just confirmed what I’ve been experiencing for the past 5 years now. It’s the most reassuring and wonderful feeling knowing that you have a soul family and soul mates that are helping you in your daily life. One of mine talks to me telepathically on a daily basis to help guide me through traffic. Ya !!!! !i m continuously meeting my soul group.soul family. Soul guides…..and they r making my path comfortable either by direct positive support or by making my way so challenging that i hav to listen &act on the msg. Of the masters ,saints &sages.